First into the Rhône-Valley to Bex and Monthey. At Pas de Morgins (1369m) we crossed into France...then via Châtel and Abondance across the Col du Corbier (1235m) to Morzine. One knows when the French border is crossed...signage becomes problematic to non-exist and it’s wise to get used to the French road-numbering system. Instead of crossing the Col de Joux Plane we finished up at the Lac de Mines d’Or. Despite it being a very pretty setting, the road ends here and it was back to Morzine. 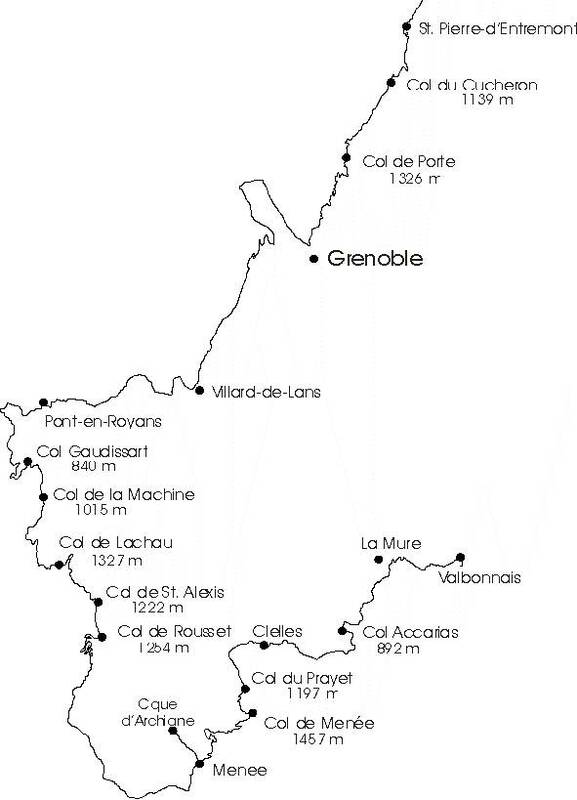 ViaTaninges („Route de Grand Alpes“) and Samoëns to the Cirque du Fer à Cheval, a 4km long and up to 700m high cliff face dotted with waterfalls. After lunch it’s past Cluses to the Col de la Colombiére (1613m) and on towards Annecy. 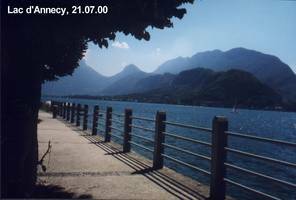 8 km after Thônes it’s a left turn to Lac d’Annecy. 4 km later, at the top of Col de Bluffy (630m) it’s another left to get to the picturesque lake at Talloires. Looping the lake to the south it’s through Duingt to Sevrier, start of the Col de Leschaùx (897m). Further southward is Le Pont fand the Col de Plainpalais (1173m), turning right onto the northern loop of Mont Revard, which provides fantastic vistas into the valleys. 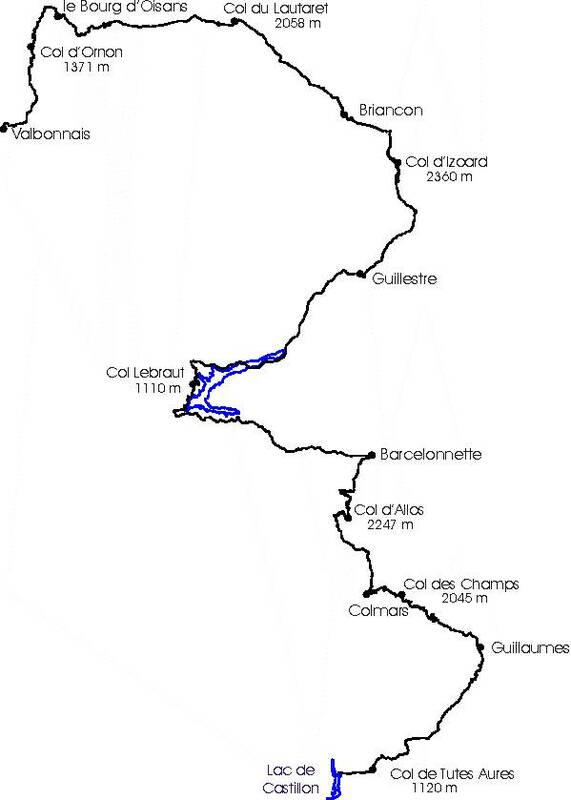 Next the Col de la Cluse (1184m) to Aix-le-Bains. In Chambery the bad signage caught us out again...the way to the Col du Granier (1134m) was only found by asking for direction at a service station...and thanks to Dietmar’s proficiency in French. Just short of St. Pierre-d’Entremont the day ends at a small camp area along the road side....and Dietmar’ s near heart-attack when the kingsize air-bed seems to leak. In the end it turns out that it’s only a loose plug. Today starts with a challenge...Grenoble is a scouts nightmare. 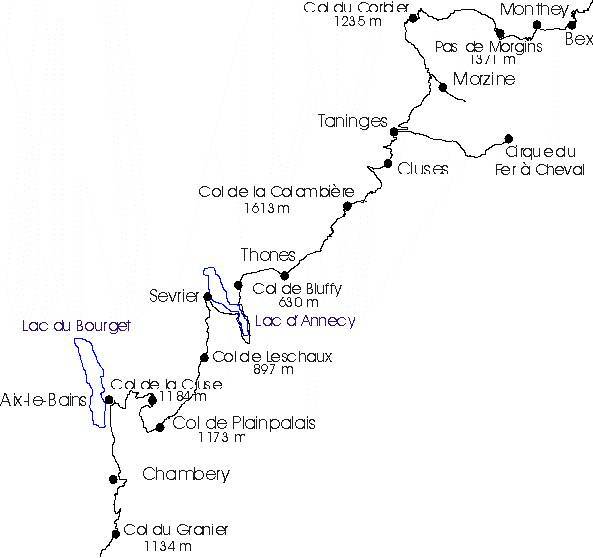 Tacking south , it’s first across the Col du Cucheron (1139m) and the Col de Porte (1326m). The right-turn to Sarcenas presents a great view across the city of Grenoble. A right turn in town got us across the Isère River and onto N 532 on the other side of the valley. Easy to find the way twards Villard-de-Lans from here... Past Villard-de-Lans are the Gorges de la Bournes, a very impressive gorge. Via Pont-en-Royans to Auberivēs-en-Royans, and left up the Col Gaudissart (840m) to the Combe Laval. 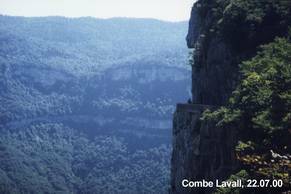 This stretch belongs decidedly into the „jewels-of-the-trip“ category...the views from Combe Laval, the sheer vertical drop...it’s breathtaking !! Across the Col de Menée (1457m) and Col du Prayet (1197m) the road drops into the valley at Clelles. Just out of mens, Dietmar realized that he was short on fuel (carrying all that extra-weight of the camp-kitchen) ...the consequent search for a petrol station also got the shopping done in one hit. The last pass of the day was the Col Accarias (892m) and everyone baulked at the thought of another stop, even though the bungee-jump off a bridge near La Mure might’ve been worth it...a few more kilometers to Valbonnais got us to the very generous camp site at a small lake. As compensation for the trouble we got some showers tokens. It seems to be a popular place, (especially with Dutch travellers)... however, it’s certainly recommendable due to it’s location at the lake and pretty surrounds. The travel continues...following the valley, the Col d’Ornon (1371m) to le Bourg-d’Oisans is first.... then via la Grave and the Col du Lautaret (2058m) to Briancon. running straight into some drizzle...time for the wet-gear. But not for long... things started to get steamy at the top as the sun came out. Pity those guys coming up the other side on their push-bikes. Guillestre is the next target, then Embrun and to Lac de Serre-Poncon, circling the lake to the west across the Col Lebraut (1110m). 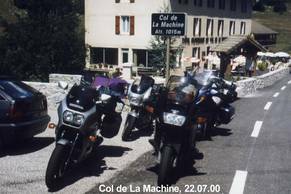 The Col d’Allos (2247m) starts at Barcelonette and is one of those passes that should be closed for any other traffic bar motorcycles...what a dream-road. Enough space to overtake with a bike, but fairly narrow for 2 cars to get past eachother. Letting the others go ahead to take some photos just short of the saddle, I was nearly cleaned up by a car on my way down, coming straight at me through one of the narrow sections. A short „Pardon“ through the wound-down window didn’t quite make up for the scare. 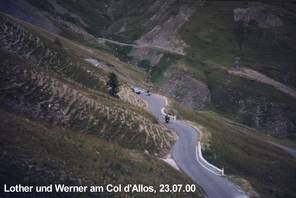 Without signs, the left-turn in Colmars to the Col de Champs (2045m) is a bit hard to find, another one of those roads that’s thoroughly recommendable, despite quite a bumpy climb....at least the descent is a bit smoother. The rock changes colour from red-brown to purple, the road flows through rock-tunnels and natural arches high above the river, this is pure magic...designed by Nature. Following the N 202 it’s across the Col de Toutes Aures (1120m) to a camp ground at the Lac de Castillon. The rain comes back, Werner and Lothar decide to pitch their own tent, which turned out to be a wise move. The floor of the tent was like a big bathtub, not letting the water out and I was gently floating atop on my air-bed. Time to re-arrange a few things, tipping out the water....and going back to sleep.